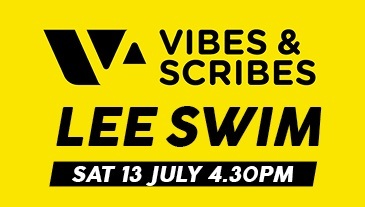 The latest version of the Instructions to Swimmers for the ‘Vibes & Scribes’ Lee Swim 2017 are included below. When registering on 22nd July, please just give your name. If you are given a different Hat or Group number at registration, you should query this. Arrive in plenty of time for every event in the schedule below. We will be dealing with more than 400 swimmers, so the importance of arriving early, particularly for registration, cannot be over-emphasised. At all times be attentive to your own safety, and the safety of those around you. Treat everyone you meet, particularly the volunteer officials and stewards, with courtesy and patience. Schedule for Saturday, 22nd July. 2:10pm to 2:20pm: Safety briefing on the boardwalk outside the Clarion Hotel. All swimmers must attend. Bring along all your swimming gear (including your swim hat and electronic timing chip) and a small bag to take your clothes from the start to the finish. 2:20pm to 2:50pm: Swimmers walk to and assemble at start at the Old Distillery Yard, North Mall. Immediately on arrival, swimmers should make their way to the Assembly Zone. All swimmers must reach the start area by 2:50pm. 3:00pm: Mandatory safety briefing. All swimmers must attend. Any swimmer that fails to arrive in time for the briefing will not be allowed swim. 3:20pm: Swimmers assemble in their starting groups and make their way to the start. Finish Time to 7:00pm: Relax on the boardwalk at Clarion Hotel. 7:30pm to ??? Detailed results and medal collection at the Bowery, Tuckey Street (about a 10min walk from the Clarion Hotel). Bring along your swim hat, if you think you may be a prize winner. Debrief and celebrate! This is the 13th running of the Swim since its re-launch in 2005. If you do not have your electronic timing chip, you will not receive a time or figure in the results. Also, if your electronic chips fails to register with the antenna on the finishing pontoon, you will similarly not figure in the results. This is extremely unlikely. To minimise the risk, please ensure that you make a positive contact by touching your timing chip against the antenna at the finishing pontoon. Numbered hats will not be used. All swimmers will be required to write their race number on their left hand at registration. This is essential for safety purposes to control check-in and check-out. 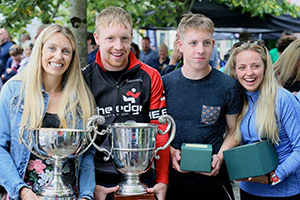 The Swim is now well established in the annual calendar of open-water swimming in Ireland. We would really like to continue to emphasise the social aspects of the day. We would love as many as possible to attend the after-swim party at the Bowery, Tuckey Street. Adult swimmers must sign on in person at the registration desk at the Clarion Hotel on the morning of 22nd July. Junior swimmers (those entered in the under-18 Swim) must be accompanied by their parent/guardian, who is responsible for registering the swimmer and for his/her safety and protection throughout the day. The registration desk, located in the foyer of the hotel and immediately to the right of the main entrance, will open at 9:00am and close at 1:30pm. Swimmers are asked to attend at registration as early as possible. Swimmers are advised to park their cars in the vicinity of the hotel (there is a multi-storey car park within 200m) and/or to make their way to the hotel on foot. Please note that there will not be any facility to register at the Swim start at the Old Distillery Yard on North Mall. Each swimmer will be required to write his/her race number on the back of his/her left hand at registration. Markers will be provided for this purpose. Each swimmer will be given two bag tags at registration. The tags will show the swimmer’s competitor/hat number. Following registration, swimmers must present a tagged bag, containing all clothing, towels, etc, needed following the Swim, to officials at the Custom House Quay entrance to the finishing area. The second bag tag should be attached to another, smaller bag to be brought to the start area. A briefing will take place on the boardwalk outside the Clarion Hotel at 2:20pm. The briefing will cover procedures at the finish of the Swim and all swimmers must attend. Following the briefing, swimmers will walk to the start of the Swim at North Mall. The distance to be walked is less than one mile (1.4km, approx.) and should be completed comfortably within 30mins. To minimise disruption to traffic, and on the instructions of the Garda Síochána, swimmers will leave the boardwalk in groups of 40. Swimmers will be directed to one of two routes, one on the southern and one on the northern bank of the Lee. Both routes will allow swimmers to assess the course of the Swim. All swimmers must arrive at the start area at the Old Distillery Yard, North Mall, no later than 2:50pm. Please note that toilet facilities at the Swim start are very limited. Officials and stewards will be deployed throughout the start area. These are all volunteer personnel and are there to ensure the safety of swimmers and the smooth running of the event. Swimmers should at all times follow the instructions of these officials with courtesy. Swimmers are also asked not to litter the start area. Any rubbish should be placed in the bins provided. Assembly Zone: This is a car park located about 50m from the security barrier at the entrance and to the right. It contains a large warehouse. Access to this area is restricted to swimmers and officials only. Swimmers should make their way to this zone immediately on arrival at the start area. Starting Platform: Accessible to swimmers and officials only. On arrival at the Old Distillery Yard, swimmers should make their way to the Assembly Zone. They should change immediately into their swim gear, put their clothes in the small tagged bag and present the bag to the vans provided. The bags will be transported to the finish, but it is most likely that swimmers will reach the finish before the bags arrive, i.e., swimmers should not rely on these bags being at the finish. At 3:30pm a safety briefing will take place in the Assembly Zone. Swimmers should be in their togs/wetsuits at this point and ready to swim, as they will move to the start area immediately after the Safety Briefing. It is mandatory that all swimmers attend this briefing. Any swimmer arriving late for the briefing will not be allowed swim. Swimmers will start in groups of 30. The groups are defined by hat number, the first group comprising swimmers with hat numbers 1 to 30, the second 31 to 60, etc. Swimmers should then line up in order of hat number, in preparation for the start. At 3:20pm, swimmers will leave the Assembly Zone in numerical order and approach the Starting Platform. The first group of swimmers (Nos 1 to 30) will be checked in by officials and allowed onto the Starting Platform. The second group (Nos 31 to 60) will be checked in and allowed onto the access ramp that leads to the Starting Platform. The next group will assemble in the chute that leads to the access ramp. Once on the starting platform, swimmers must follow the instructions of the Starting Platform Manager. When he is satisfied that all swimmers are present and ready to swim, he will pass control to the Official Starter. Please note that the Starting Platform is not wide enough to accommodate a single row of 30 swimmers. Some swimmers will be in a second or third row. In a swim of 2,000m a swimmer’s position on the start line will have no influence on the result. At 3:30pm, the Official Starter will start the first group by calling ‘Take your marks’ and then sounding a hooter. Swimmers should enter the water, by diving or jumping, when the hooter is sounded. Once the first group has started, the second group will move from the access ramp to the Starting Platform and the third group will move onto the access ramp. This sequence will be repeated until all groups have started. For safety reasons, swimmers are asked to stay as close as possible to the centre of the river. Rescue boats and kayaks will operate at the river’s edges and may be moving in the opposite direction to swimmers. Staying as close as possible to the centre will minimise the risk of collision with one of the boats. If, at any stage during the course of the swim, a swimmer feels that he/she needs assistance, he/she should stop, raise one arm and call to the nearest boat or kayak. There are numerous ladders and steps allowing egress from the river throughout the course of the Swim. Ladders are easily identified by a red rectangle painted on the quay wall behind each. If a swimmer decides to leave the swim for any reason, he/she should continue on foot to the finish area and report to the Finish Area Co-ordinator. Once a swimmer leaves the course he/she is not free to re-join the swim. The finish of the swim will be at a pontoon moored immediately downstream of Clontarf Bridge. Electronic touch pads will be attached to the pontoon to record finishing times. Competitors must touch the pads to register a finishing time. Swimmers must touch the pads with the hand to which the electronic chip is attached. Swimmers will hear a loud beep as their finishing times are recorded. They should then move immediately to their right and inside the rope marking the approach to the finishing pontoon. Maintaining their finishing order they should then swim downstream passing the floating platform attached to the boardwalk and give their Swim numbers and names to other officials on the platform. This area will be monitored by additional lifeguards. The instructions of the lifeguards and other stewards should be followed at all times. Swimmers should leave the water by way of the steps immediately downstream of Eamonn De Valera Bridge that lead onto Customs House Quay. These steps are also the designated exit point for any emergency that might take place on the water. In the event of any such incident, swimmers must obey the directions of the stewards. Swimmers should remove their electronic chip and place it in the bin provided at the top of the steps. Cold water showers will be provided on Custom House Quay, courtesy of Cork City Fire Brigade. Swimmers should retrieve their bags on Custom House Quay and change before making their way to the boardwalk area outside the Clarion Hotel, where a barbecue and post-swim entertainments will be provided. The LSOC has invited a number of guests to this function including the Lord Mayor of Cork and senior representatives from Vibes & Scribes, Cork City Council, the Port of Cork Company and Cork’s 96FM. Swimmers should give their attention to the invited speakers. Details of further celebrations will be announced closer to the Swim. Behaving in any way that is judged to be dangerous to self or others. Spectators are requested to obey the stewards at all time. Spectators will not be allowed beyond the security barrier at the start (Wyse’s Quay) nor onto St Vincent’s Bridge. Spectators will not be allowed beyond the barrier chains at Albert Quay and Albert Quay East. 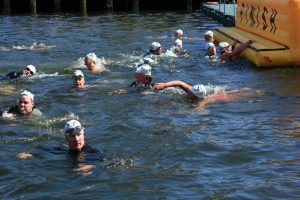 Spectators are advised and encouraged to watch the start of the Swim from the public footpath at the North Mall and should not gather on the southern side (Bachelors Quay) of the river. Open-water swimming is a contact sport. All participants should realise this upon entering the Swim and behave accordingly. This may include swimming with your head up much more often than normal in pool swimming and expecting to perhaps have your goggles knocked off at least once during the Swim. Maximum contact is expected at the start, around the right turn to enter the final channel and at the finish line. Swimmers wishing to minimise contact should start 10 seconds after their group, swim wide (left) on the turn and stay to the far left at the finish (while still using the centre span of the last bridge). During the swim, other contact (elbows and hands) may be expected when side by side with one or two other swimmers and when one swimmer is on another swimmer’s feet. Intentional and/or continued contact is not allowed and will result in disqualification from the Swim. Swimmers wishing to minimise contact should simply stop for a few seconds when they are side by side and slow down or change direction when approaching another set of swimmers feet. “Drafting” or swimming in another’s slipstream is permitted, however this may increase the risk of contact for the trailing swimmer.